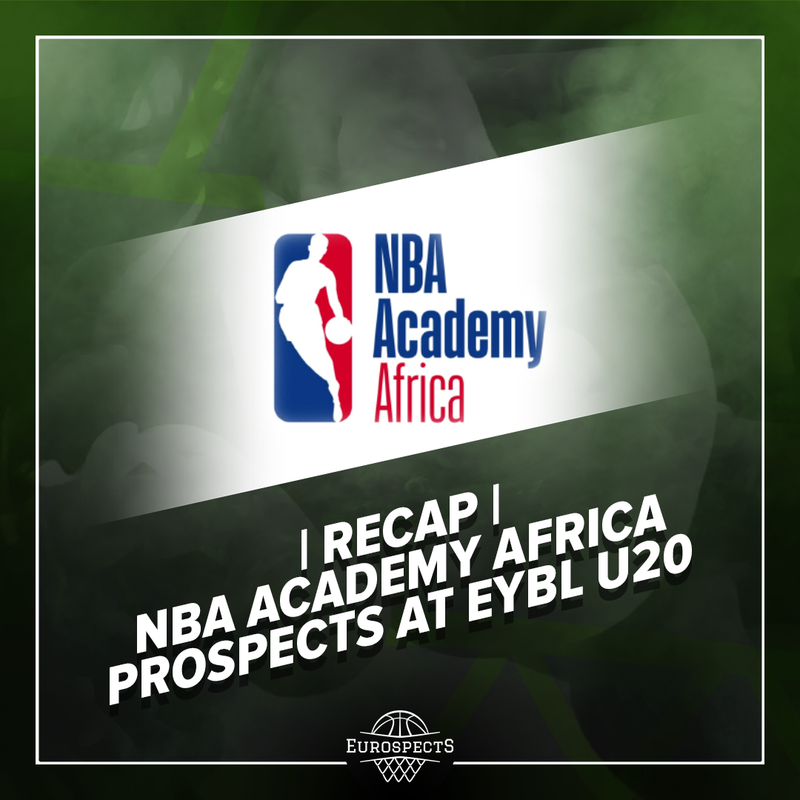 European Youth Basketball League U20 group stage tournament in Pecs, Hungary was opportunity to finally watch NBA Africa Academy on our continent after problems they had lately with getting visas for tournaments in Spain, most precisely on Canary Islands and in L’Hospitalet. Most of the players I knew from GBA Invitational in Prague last season, just physical swingman Patrick Mwamba committed to UT Arlington and became first ever college recruit from this particular academy and truly unicorn prospect even for NBA standards Ibou Dianko Badji lately landed a gig with Barcelona. Team is unbeaten and currently sits at #1 seed. Normally we could state that competition benefits from participation of African prospects way more than them from playing on this level. However it does make sense at this point given recent problems and lack of proper & frequent competition in Senegal. Anyway in next years this may not be enough to provide challenging enough environment unless some of Euro powerhouses join EYBL as well. Players from newly launched NBA project which resides in Saly have many flaws (raw in general, not enough ball handling & jumpshooting, feel for the game shortcomings, switching and tools compensate but bad D fundamentals) and some of them are hardly refinable as certain things are much more simple to improve at younger age. Nevertheless sky is the limit once program is implemented since grassroots level. You can’t teach that length so if you scout, select and coach kids with such profiles & athletic predispositions early then it can really become almost mass production of tantalizing prospects. Roster I saw may lack elite of elite talents like Badji but still there was handful of noteworthy potentials which I decided to shortly evaluate below. KURT CURRY WEGSCHEIDER (2001, GUARD, CENTRAL AFRICAN REPUBLIC) Very smooth combo who definitely doesn’t play like typical African guard. By the way it will be actually interesting how many backcourt players program can produce next years comparing to tall guys who are simply way more predisposed to make it big and can still achieve it without great environment or despite late introduction to the game. Kurt can spend time on either PG and SG positions. Moreover it seems like he has a Curry in the surname for a reason. He is a sharpshooter who does get streaky but has a clean, repeatable form which gives hope that he can reach consistency and specialized status next years. Talented player who was MVP of BWB NBA camp in 2017 sports solid size, light but lean frame, and is electric getting off his feet towards the basket. His excellent quickness gives solid advantage in open court and makes him highly usable defender for pressing ball handlers way above the three point line on. He remains under control, seems very coachable and shows decent amount of poise at the same time. I didn’t notice him taking overly big decision making burden on his shoulders but plays rather patient, mistakes free basketball, presents solid feel and ocassionaly can find open man in creative fashion during PnR situations. Handles are rather basic but reliable. Maybe doesn’t offer a ton in terms of shot creation but with his speed, spot up J threat and two man game upside it is not a big disadvantage. Brings very attractive mix of contribution on both ends and got to like how balanced he remains while looking for his scoring opportunities. Potentially can end up on high European level. Rather no skill but picked the basketball as late as three years ago and possess basically Deandre Jordan type of profile, maybe only without such a huge bounce. Anyway he stole the show past summer during G League invitational after being measured 6’10 with 242 pounds and enormous 7’7 wingspan. Imposing body and very good mobility helps as far as getting up & down the court quickly for a big or offering rim protection and can even provide in time substantial amount of perimeter defense. However skill level is likely to remain low. While watching the warm up, mid range form looked very inconsistent, flat with some bad misses (also below 40% FT shooter) which however was sporadically followed by 2 makes in a row. Those hands may not be great but if you grind every day can definitely reduce amount of stiffness to utilizable level. In games situations he is dependent on having great point guard in the line up but has all the tools to become high level finisher. Few times he converted super basic hooks close to the hoop over defenses thanks to great extension he gets while putting those longish arms in the air. Timothy committed to Georgetown last November and probably it’s hard to find someone else who can help him as much as Patrick Ewing. Needs a huge work as far as footwork, fundamentals, tactical knowledge and whatnot but NBA dream is not out of his mind blowing reach with further development and committment to work. Modern, undersized big man born in late 2001 was extremely productive thanks to his neverending energy. Possess really well proportioned body shape, good length, quickness and jumping ability. Fits the mold of centers who thrive nowadays: not super tall but compensates with wingspan, highly switchable, crashes the glass, runs the court fast (despite slightly crooked legs) and finishes with the dunks. Low level of competition but averages ridiculous 8 offensive rebounds per 36 minutes. Feel and skill is a work in progress but is such a hardplaying and physical guy that makes impact all around. Alters plenty attempts and really does have intriguing defensive potential thanks to foot speed, ability to lower his hips and simply willingness to take pride in not glamorous small or sometimes even dirty tasks on the court. Solid rolling to the rim, loves putbacks. Must improve hands and probably wouldn’t look good in overly complicated system. Good not great small ball center potential at this point. Evaluation setting vs better competition would help to judge how translatable his game can become. Interesting wing with good first step and ability to attack closeouts. Very fluid and coordinated, looks around 6’6 or 6’7 with some extra length. Pitbull defender. Locked in, gets extremely low, claps to motivate himself and presses full court if necessary. A bit wildstyle but if you embrace that can become nightmare matchup for ball handlers. 2000 born but seems to be somewhat late bloomer. Must fill out badly but looks kinda naturally talented. Sometimes maybe a bit too passive. Had small shooting sample but doesn’t look broken. Was very overshadowed by Amar Sylla or Biram Faye during U18 African Championship. Don’t know his history too well but combination of attitude, height, athleticism, straight line driving, suggestive room for improvement and defensive potential makes him intriguing prospect at first impression. Long limbed, tall and very lanky forwards. Raw but spiderman body, defensive potential and considerable long term upside. Should not be ignored.